maruta experiment | May We Speak? During World War II, Nazi doctors performed human experiments on Jews, such as injecting poisons in their bodies or removing their sexual organs. Likewise, the Japan also performed barbarous experiments on Asian prisoners of war. During World War II, Unit 731 used prisoners captured in China, Russia, Korea and Mongol as guinea pigs to develop bacteriological weapons. These prisoners were called “Maruta,” meaning “logs” in Japanese, revealing Japanese sentiments that such prisoners were not even human. 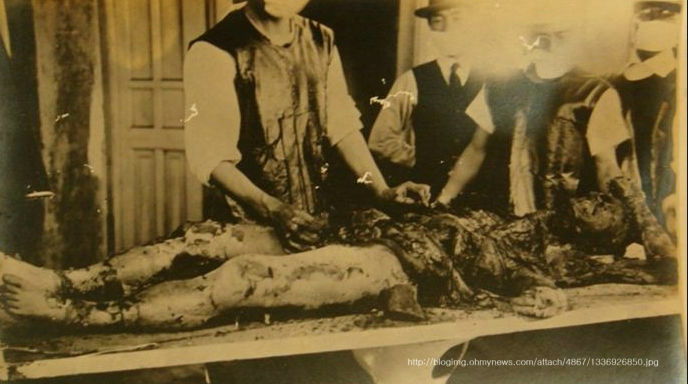 The various types of experiments performed by Unit 731 were shocking. Experiments and dissections on “marutas” were done without anesthesia to increase the precision of experiments. Such experiments included cutting off parts of the human body and attaching it elsewhere or cutting pregnant women’s stomachs open and removing the undeveloped fetuses. In addition, human experiments to build weapons such as bacteriological weapons were common – they would inject germs “for vaccination” in the subjects’ bodies, or simply peg them down to burn them with a flamethrower. Approximately 600 Asian men and women fell victim to these inhumane crimes, and it was confirmed that at least 3000 “marutas” were killed during the Second World War. Copyright 2017 VANK- All Rights Reserved.